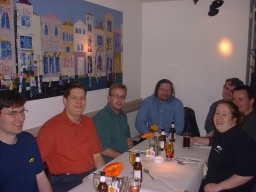 As SAGE-WISE's President from 2001-2003, I thought I'd take photos to show what happens at one of the events. 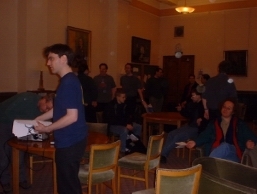 These photos are from 8th April 2003, when Tony Finch spoke to the London branch about "Evolving Email at Cambridge". 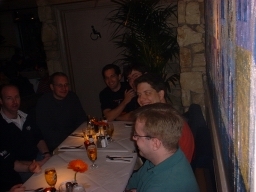 As you will see, there is a meal, then the meeting, then a pub trip - quite a good evening. Fanf the speaker, David, Mike B and the Committee. 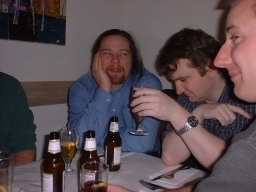 Mike looking bored, Kieran looking sozzled, and Graham looking mischievous. 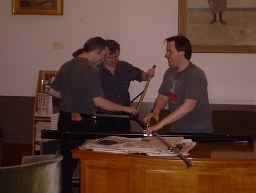 Here's one for you... "how many geeks does it take to put up a screen"? Sean, Kieran and MBM have a go. Assembling ready for the talk. 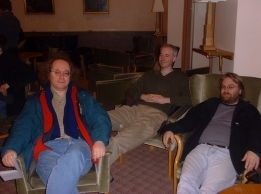 Edmund and friends look laid back. 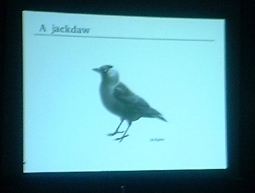 Fanf's talk had lots of birds in it. Here is one of them. Snap! 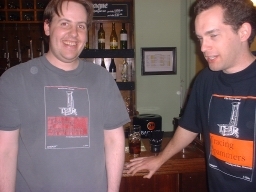 MBM and Ben Argyll compare differently aged t-shirts. 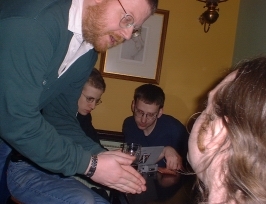 The beardy chaps (Ingvar and Sean)have a discussion, while the youngsters (Bill and Chris) look earnest behind. 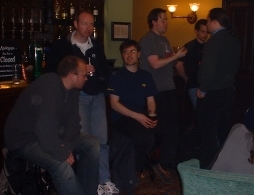 Group scene at the post-meeting pub. 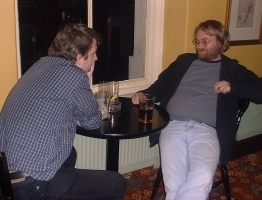 Edmund (still laid back) and Kieran. 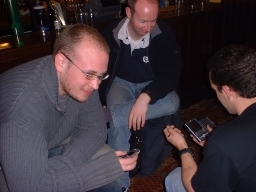 Obligatory geeking and PDA comparisons.